English – call to Rome | Katakombenpakt erinnern und erneuern! Call to Rome: Commemorate and renew the Pact of the Catacombs! We approach the 50th anniversary of the so-called Pact of the Catacombs: towards the end of Vatican Council II, on November 16, 1965, 40 Council Fathers, later 500, signed the pact, thereby committing to a church that shares “the joys and the hopes, the griefs and the anxieties of the men of this age, especially those who are poor or in any way afflicted” (GS 1). They picked up a topic that was mentioned by the Council, but discussed only very marginally. Those bishops made their contribution that the church at least in parts would become a “truly poor, missionary and Paschal church, free from all temporal power and engaged for the liberation of the entire person and of all human beings” (Medellin 5.15). 50 years later, the pact has not lost any relevance. On the contrary: the devastation of our world increases… But there are also signs of hope. All over, protests and insurrections are rising up. Pope Francis claims the reversion to a “Samaritan Church”. The time is suitable: Now it´s up to us to pick up and update the legacy of Vatican II and the Pact of the Catacombs. Therefore, we cordially invite you to an international meeting. The assembly will take place from November 11 – 17, 2015 in Rome and end with a liturgy in the Domitilla Catacombs. At the assembly we want to commemorate and understand the Pact of the Catacombs within the processes and conflicts that lead to its formation and that evolved from it. The Pact stands for a prophetic line of tradition; we want to inscribe ourselves in this line of tradition by renewing and updating the ideas of the pact today. – How and where do we as Christians proceed against poverty, exploitation and structures of economic injustice? – What do we contribute to a world of freedom, in the midst of violent crises and conflicts? – How do we stand up for gender sensitive and just conditions in church and world, against discrimination and misanthropy? – How do we act for the conservation of creation and the interests of future generations? – How do we fight at the side of migrants and refugees against border regimes and racist structures in our societies? Let´s not lose connection in these questions! 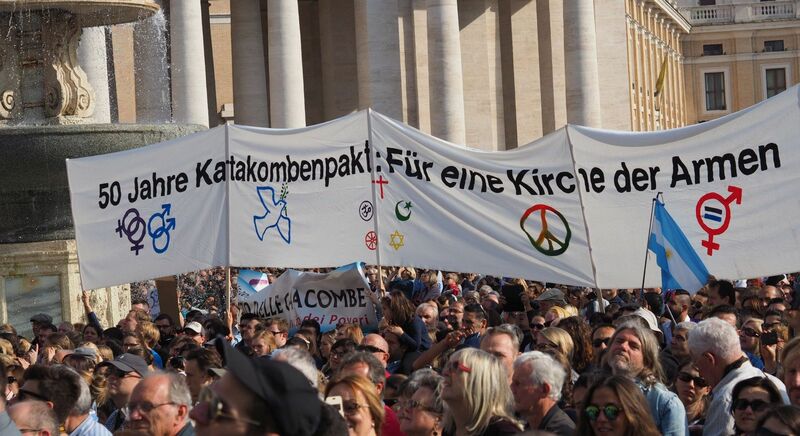 Let´s put a sign in the centre of the church power that the Pact of the Catacombs is not a historic relict, but that its requests are still being picked up today by Christians all over the world in their concrete action on the side of those made poor and marginalized! Like the bishops of the pact, we want to be sensitive to the signs of the time in hope and resistance. Together with these bishops and Pope Francis we demand a radical reversion: from the fetishism of money to the protection of life in humans and nature; from an economy that kills to an economy that ensures the life of all in the common house of our globe; from the globalization of indifference to a lived solidarity. We are convinced: a different way of being human in a different Church for a different world is possible!